I have always baked for comfort. I remember making up recipes with my sister: brownies with butterscotch chips, rocky road cookies, peanut-butter banana bread. Half of the time they were disasters, but sometimes we found a hit. My mother tolerated it well, and when I bake with Sally I try to remember this. I do almost all my baking with Sally these days. She likes to eat the dry mix, which is a little weird since it's usually some combination of plain whole wheat flour, baking soda, baking powder, salt, and yeast. The other day when we were making lunch, she drank a combination of milk and drained tuna juice. But she's a good little helper, particularly when you need someone to clean out a yogurt container or use a whisk. Still, it's nice sometimes to be in the kitchen without her. The other night Alex had a meeting and Sally went to bed early, and I found myself with an unexpected moment. I was tidying up, and I found a book Sally had pulled off the shelf: The Country Art of Blueberry Cookery by "The Blueberry Lady," Mrs. Clifford David Morrison. I paged through it and got excited about a recipe for Nona's Blueberry Muffins, and then realized Sally had eaten the last frozen berries for breakfast. Still, we had cranberries. And flour and eggs and milk. I turned on the oven and pulled out a muffin pan. The version I made was probably not much like Nona's. 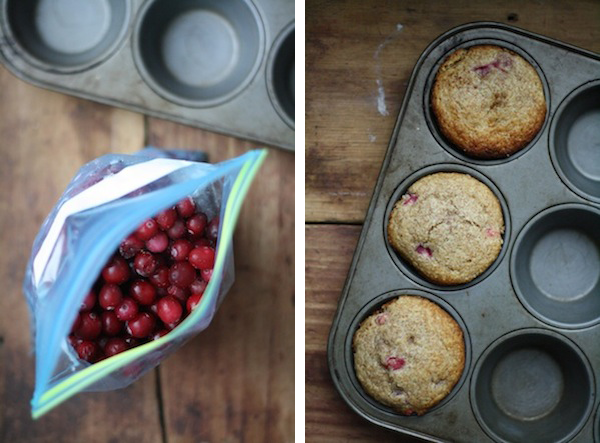 She called for all-purpose flour and I used whole wheat, and the cranberries made the muffins more sweet-tart than sweet. They are nothing like the treats Anna and I made as kids. But to my grown-up self, they are much better. They tucked me into bed that night with butter and a glass of milk, and I had no qualms the next morning about packing two in Alex's lunch and letting Sally devour another for breakfast. You could add any berry to these muffins and get a keeper—I'd especially like to try a blackberry version. The recipe comes originally from Nancy Nona Phillips in Greenfield, MA, and makes enough batter to fill a standard 12-cup muffin tin. Preheat the oven to 400 degrees F. Whisk together the flour, baking powder, salt, and sugar in a large bowl. In a separate bowl, beat together the egg, milk, and oil. Pour the wet ingredients into the dry ones, then fold them together with about 12 stirs. Add the berries, stir once more, and pour the batter into a greased muffin tin. Each cup should be level full. Bake for 25-30 minutes, or until the tops are golden brown. Carefully remove the muffins from the tin and place them on a rack so that the steam can escape.